City Major, Francisco Cuenca, says that the City Council has promoted a pioneer initiative in Andalusia that is make a reality in Granada for the first time. Free transfer between Light Rail and Buses is expanded to the whole itinerary of Light Rail, that, in addition to Granada, includes municipalities of Albolote, Armilla and Maracena. This measure, that it is expected to come into force on July, means that within one hour, transfer between light rail and buses will have no cost. The Major, Francisco Cuenca, has remarked that, it is an pioneer initiative in Andalusia that is make a reality in Granada for the first time. Recalling that the City Council of Granada has signed a few months ago an agreement with Junta de Andalucía to guarantee cost-free transfers in the city, Cuenca has valued the insistence of all people here gathered and the work that has been made since more than a year with the Counselling of Development, until we sign the agreement, a pioneer agreement with no precedent in other cities that has required a legal procedure, an economic framework and a indispensable complex´s technological development. The firs counsellor, that has announced this morning the agreement for the implementation of the initiative, has appeared in the City Council of the capital beside the delegate of Development of Junta de Andalucía in Granada, Juan Antonio Martín Núñez; City Council of Albolote, Concepción Ramírez, and City Councils of Armilla and Maracena, Gerardo Sánchez and Noel López. All of them have concurred that the integral intermodality between light rail and bus means a step forward in metropolitan vision of transport that citizens are demanding. So, Cuenca has highlighted that what is behind this metropolitan vision of mobility is the will of improve every day public transport because this way we contribute to improve quality of life of citizenship, that is what we are working on. If we keep the car at home, no doubt that environment improves and this improves health of our neighbours as well. The first counsellor, that is tremendously proud of the expansion of free transfer all over the itinerary of light rail, has appreciated Junta de Andalucía its willingness to negotiate and its bet for the improvement and promotion of a coordinated public transport. In this sense, has coincided with the delegate of Development that, once this essential technical modifications are made, it is expected that in July this initiative can be a reality. 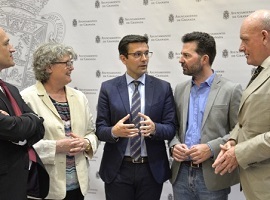 Granada is a metropolitan city with more than half a million people and municipalities have to work togheter to offer public services from this metropolitan vision, because that is how citizens sense it in their daily life, has concluded.